Esports is gaining huge momentum this year. We’ve seen it grow beyond Twitch and become staples on television stations like ESPN and TBS. But if you’ve followed any esports team, you’ll notice that all the jerseys look exactly the same. Reminiscent to racing jerseys and cars, the typical esports jersey is plastered with sponsorship logos and are only distinguishable with team logos and colors. However, ULT wanted to change all of that. 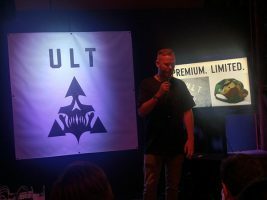 In an exclusive interview with Nate Eckman, Lead designer for ULT, we got a chance to talk about the apparel launch, the inspiration behind the brand, the style and the future. ULT is a premium esports lifestyle brand under the Ultimate Media Ventures banner, as part of our ULT Labs fund initiatives to enhance the esports community. ULT exists to elevate contemporary wearables for the esports fans, players, leagues and casters. I’ve been a gamer my whole life. I’m obsessed with esports and love being a part of this amazing community. I, honestly, cannot stand the horrible products that are available often times to us. Therefore creating entirely new products was important to me. I’ve talked to so many fans, team owners, players, casters, streamers and other designers for years about the state of the products for our industry. It pains me to see passionate fans who love eSports given only embarrassing options of apparel to purchase in support of what they love. To hear from fans about how the clothing they wear makes them feel embarrassed or ashamed in public is unbearable to me. With ULT we were inspired to offer better products from a material and design standpoint. I want players and fans who wear ULT to look and feel awesome. We have a community-first design philosophy. If we can make design choices to create better products for the community we will do that. We belong to the community. We’ve dedicated our profession to it. We’ve been doing this for publishers for years, only now with ULT can we demonstrate our design point of view without having to edit or limit it. The style is very modern and minimal. We keep a clean aesthetic and apply contemporary design principles to how we source materials, produce things locally and customize garments with hand-touched elements. These things take more time and resources but they are important to us. We are from Los Angeles and having that be clear in the style is important to us too. Esports is a global ecosystem but LA plays a significant role in that space. 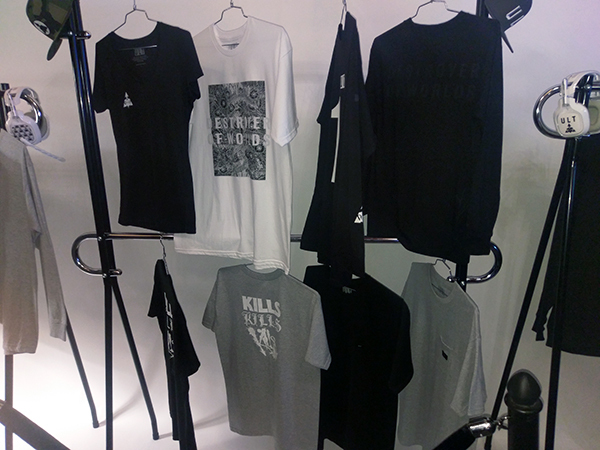 We held a private reception for the ULT esports lifestyle apparel brand launch in Los Angeles to showcase the first collection called ‘kills’ with 15 pieces in the show. We unveiled the installation to a room full of media, influencers, publishers and partners from the gaming and esports industry. Everyone at the show received a limited edition item not for sale that was only available at the event. We launched ULTesports.com and people are now able to purchase the line for the first time. It has been a lot of work but getting to collaborate with some of my favorite street-wear designers from LA in the process has been completely incredible. Technical gear for the players, teams and streamers that is suitable and logical to the context of esports. Also, Caster Couture with custom suits, ties and accessories for our beloved shoutcasters and team executives. More women’s products for sure. More collaborations with artists and players. And of course, more products. Visit ULTesports.com to pickup pieces from the limited edition ‘kills’ collection. Follow ULT on Twitter @ULTlosangeles and Instagram @ULTesports.